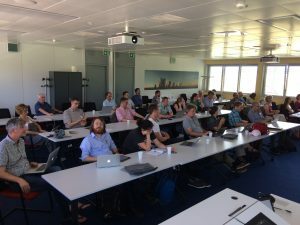 The inaugural 4MOST Science Team Meeting was held at Geneva Observatory on 18 – 21 June 2018. More than 40 participants discussed a wide range of topics in connection with the scientific planning for the 4MOST survey programme. The focused discussion sessions, the general collaborative spirit and the welcoming atmosphere at Geneva Observatory all contributed to the success of this meeting.